Besides being a very cool word, ahnentafel is a cool tool. 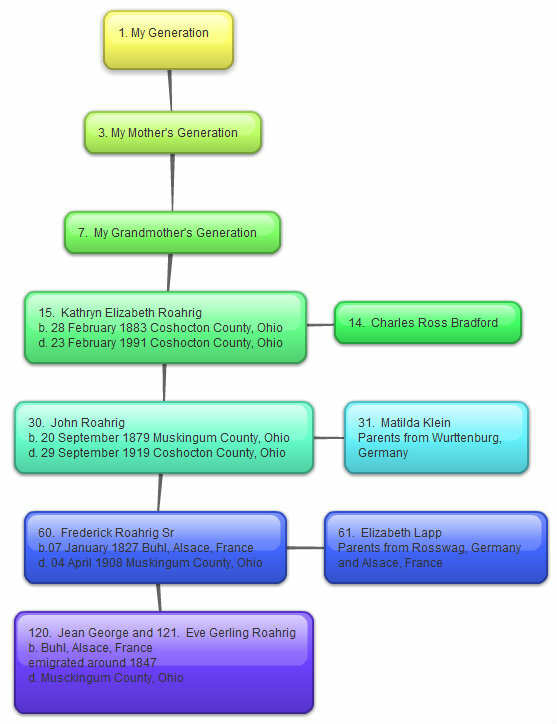 This numbering system permits the family historian to organize genealogical tidbits into a concise framework of chronology and relationships. The resulting document converts a tomb of family history into a pocket-sized widget. As for technology geeks– we can create an ever-increasing number of ahnentafel representations. Source: Family Register Report for Frederick Roahrig, Sr. by Doug Kreis. I do love Google Maps. It’s been a terrific tool for tracking migrating families. The graphic interface has pointed me to counties and communities I would not have considered researching without seeing the paths these families took.